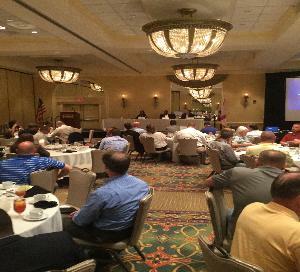 Yesterday, Daymon Allmon and Chip Post both attended the AGC Florida East Coast Chapter Membership Lunch. This event was held at the West Palm Beach Marriott from 11:30 am to 2:00 pm. HSMC had some key guest speakers at the lunch such as Bill Edwards, Director of Diversity, Christopher Bauer, Construction Manager, and Joseph Kralis, Project Manager. It is always a pleasure for us to learn about upcoming project opportunities and to meet with key project team members. We can’t wait for the next one!